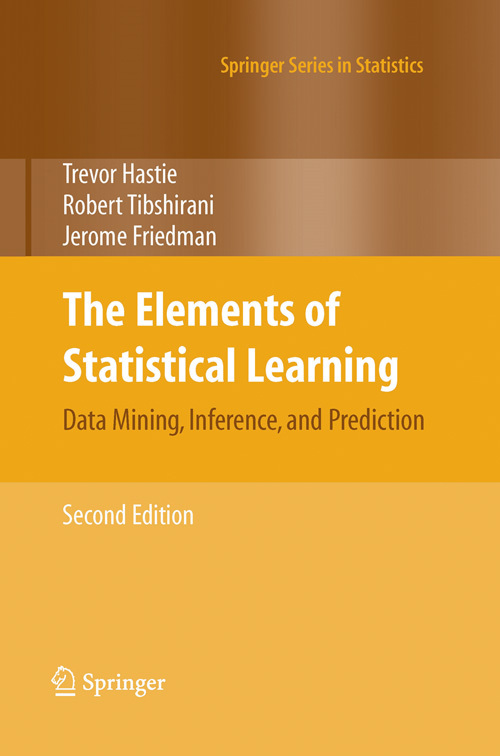 The AstroStat Slog » Blog Archive » [Book] The Elements of Statistical Learning, 2nd Ed. This was written more than a year ago, and I forgot to post it. I’ve noticed that there are rapidly growing interests and attentions in data mining and machine learning among astronomers but the level of execution is yet rudimentary or partial because there has been no comprehensive tutorial style literature or book for them. I recently introduced a machine learning book written by an engineer. Although it’s a very good book, it didn’t convey the foundation of machine learning built by statisticians. In the quest of searching another good book so as to satisfy the astronomers’ pursuit of (machine) learning methodology with the proper amount of statistical theories, the first great book came along is The Elements of Statistical Learning. It was chosen for this writing not only because of its fame and its famous authors (Hastie, Tibshirani, and Friedman) but because of my personal story. In addition, the 2nd edition, which contains most up-to-date and state-of-the-art information, was released recently. You’ll find examples, R codes, relevant publications, and plots used in the text books. Second, I want to tell how I learned about this book before its first edition was published. Everyone has a small moment of meeting very famous people. Mine is shaking hands with President Clinton, in 2000. I still remember the moment vividly because I really wanted to tell him that ice cream was dripping on his nice suit but the top of the line guards blocked my attempt of speaking/pointing icecream dripping with a finger afterward the hand shaking. No matter what context is, shaking hands with one of the greatest presidents is a memorable thing. Yet it was not my cherishing moment because of icecreaming dripping and scary bodyguards. My most cherishing moment of meeting famous people is the half an hour conversation with late Prof. Leo Breinman (click for my two postings about him), author of probability textbook, creator of CART, and the most forefront pioneer in machine learning. The conclusion of that conversation was a book soon to be published after explaining him my ideas of applying statistics to astronomical data and his advices to each problems. I was not capable to understand every statistics so that his answer about this new coming book at that time was the most relevant and apt one. This conversation happened during the 3rd Statistical Challenges in Modern Astronomy (SCMA). Not long passed since I began my graduate study in statistics but had an opportunity to assist the conference organizer, my advisor Dr. Babu and to do some chores during the conference. By accident, I read the book by Murtagh about multivariate data analysis, so I wanted to speak to him. Except that, I have no desire to speak renown speakers and attendees. Frankly, I didn’t have any idea who’s who at the conference and a few years later, I realized that the conference dragged many famous people and the density of such people was higher than any conference I attended. Who would have imagine that I could have a personal conversation with Prof. Breiman, at that time. I have seen enough that many famous professors train people during conferences. Getting a chance for chatting some seconds are really hard and tall/strong people push someone small like me away always. The story goes like this: a sunny perfect early summer afternoon, he was taking a break for a cigar and I finished my errands for the session. Not much to do until the end of session, I decided to take some fresh air and I spotted him enjoying his cigar. Only the worst was that I didn’t know he was the person of CART and the founder of statistical machine learning. Only from his talk from the previous session, I learned he was a statistician, who did data mining on galaxies. So, I asked him if I can join him and ask some questions related to some ideas that I have. One topic I wanted to talk about classification of SN light curves, by that time from astronomical text books, there are Type I & II, and Type I has subcategories, Ia, Ib, and Ic. Later, I heard that there is Type III. But the challenge is observations didn’t happen with equal intervals. There were more data mining topics and the conversation went a while. In the end, he recommended me a book which will be published soon. Having such a story, a privilege of talking to late Prof. Breiman through an very unique meeting, SCMA, before knowing the fame of the book, this book became one of my favorites. The book, indeed, become popular, around that time, almost only book discussing statistical learning; therefore, it was an excellent textbook for introducing statistics to engineerers and machine learning to statisticians. In the mean time, statistical learning enjoyed popularity in many disciplines that have data sets and urging for learning with the aid of machine. Now books and journals on machine learning, data mining, and knowledge discovery (KDD) became prosperous. I was so delighted to see the 2nd edition in the market to bridge the gap over the years. —————————– Here, I patch my scribbles about the book. What distinguish this book from other machine learning books is that not only authors are big figures in statistics but also fundamentals of statistics and probability are discussed in all chapters. Most of machine learning books only introduce elementary statistics and probability in chapter 2, and no basics in statistics is discussed in later chapters. Generally, empirical procedures, computer algorithms, and their results without presenting basic theories in statistics are presented. In addition to its historical footprint in the field of statistical learning, I’m sure that some astronomers want to check out topics in the book. It’ll help to replace some data analysis methods in astronomy celebrating their centennials sooner or later with state of the art methods to cope with modern data. This new edition reflects some evolutions in statistical learning whereas the first edition has been an excellent harbinger of the field. Pages quoted from the 2nd edition. [p.28] Suppose in fact that our data arose from a statistical model $Y=f(X)+e$ where the random error e has E(e)=0 and is independent of X. Note that for this model, f(x)=E(Y|X=x) and in fact the conditional distribution Pr(Y|X) depends on X only through the conditional mean f(x). The additive error model is a useful approximation to the truth. For most systems the input-output pairs (X,Y) will not have deterministic relationship Y=f(X). Generally there will be other unmeasured variables that also contribute to Y, including measurement error. The additive model assumes that we can capture all these departures from a deterministic relationship via the error e.
How statisticians envision “model” and “measurement errors” quite different from astronomers’ “model” and “measurement errors” although in terms of “additive error model” they are matching due to the properties of Gaussian/normal distribution. Still, the dilemma of hen or eggs exists prior to any statistical analysis. [p.30] Although somewhat less glamorous than the learning paradigm, treating supervised learning as a problem in function approximation encourages the geometrical concepts of Euclidean spaces and mathematical concepts of probabilistic inference to be applied to the problem. This is the approach taken in this book. Strongly recommend to read chapter 3, Linear Methods for Regression: In astronomy, there are so many important coefficients from regression models, from Hubble constant to absorption correction (temperature and magnitude conversion is another example. It seems that these relations can be only explained via OLS (ordinary least square) with the homogeneous error assumption. Yet, books on regressions and linear models are not generally thin. As much diversity exists in datasets, more amount of methodology, theory and assumption exists in order to reflect that diversity. One might like to study the statistical properties of these indicators based on mixture and hierarchical modeling. Some inference, say population proportion can be drawn to verify some hypotheses in cosmology in an indirect way. Understanding what regression analysis and assumptions and how statistician efforts made these methods more robust and interpretable, and reflecting reality would change forcing E(Y|X)=aX+b models onto data showing correlations (not causality).